Summer has arrived, and with it the temptation to buy a convertible. Three hot newcomers to the Czech market offer the joy of driving with the wind in your hair for relatively reasonable prices. THE 3.65-METER long Ford Streetka is a two-seater manufactured by Pininfarina, an Italian body maker, on the base of the Ford Ka model. Its four-cylinder, front-wheel-drive, 1.6-l, 95 hp (70 kW) Duratec engine, mated with a five-speed gearbox, powers this compact roadster to over 170 km/h, sprinting from 0 to 100 km/h in 12.1 seconds. While the rounded rear end contains 215 litres of luggage space, the gas tank holds just 40 litres. On the Czech market, base price for the Ford Streetka is CZK 639,000, but as is the case elsewhere in Europe, it is available in only limited numbers. This year Czech customers will probably have to wait for several dozen Streetkas – this will make the attractive roadster a fashion item. THE 4.08-METER long New Beetle Volkswagen cabriolet, which comes to Europe from Mexico, is stylized in its traditional shape. Like the closed New Beetle, its rounded, retro body hides a modern chassis with a front-mounted transverse engine and front-wheel drive. The classically conceived multi-layer roof, which is also visible when folded up, emphasizes the distinct appearance of this car, setting it apart from its coupé-cabriolet competitors with solid collapsible roofs, be they metal or glass. Another advantage is that folding down the roof does not diminish the 201 liters of luggage space. 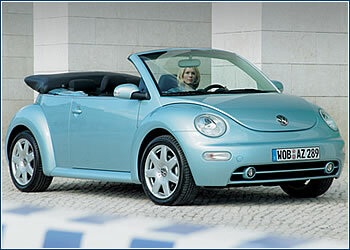 The New Beetle Cabriolet sells in Europe with 1.4-, 1.6-, and 2.0-l gasoline engines, as well as with an economical 1.9-l TDI turbodiesel. One tankful (55 l) takes the car up to 1,000 km. Price on the Czech market will be announced soon. 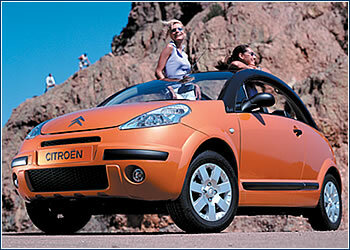 THE CITRO¨EN C3 PLURIEL, a 3.93-meter long, front-wheel-drive car with a variable body and no central columns, offers surprisingly versatile uses. 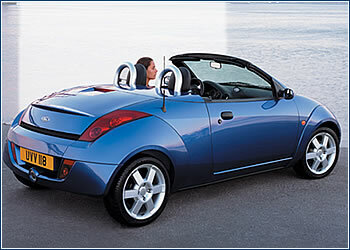 Thanks to its electrically controlled collapsible roof, hinged rear window, and detachable roof arches, the closed Pluriel can be changed to a semi-cabriolet, then to a completely open cabriolet, and finally, by folding down the back seats, a two-seat pickup whose bed can be extended to 1.75 meters by swinging the rear doors into a horizontal position. Folding the roof and the rear window into the luggage space cuts its volume in half – from the original 267 to 137 liters. The gas tank holds 47 l, enough for 600 to 700 km. With a 1.4-l, 75 hp (55 kW) gasoline engine and a five-speed gearbox the Pluriel can be purchased for under CZK 500,000, but more demanding customers can buy a Pluriel with a more powerful 1.6-l mated with a five-speed robotic SensoDrive transmission with no clutch pedal.